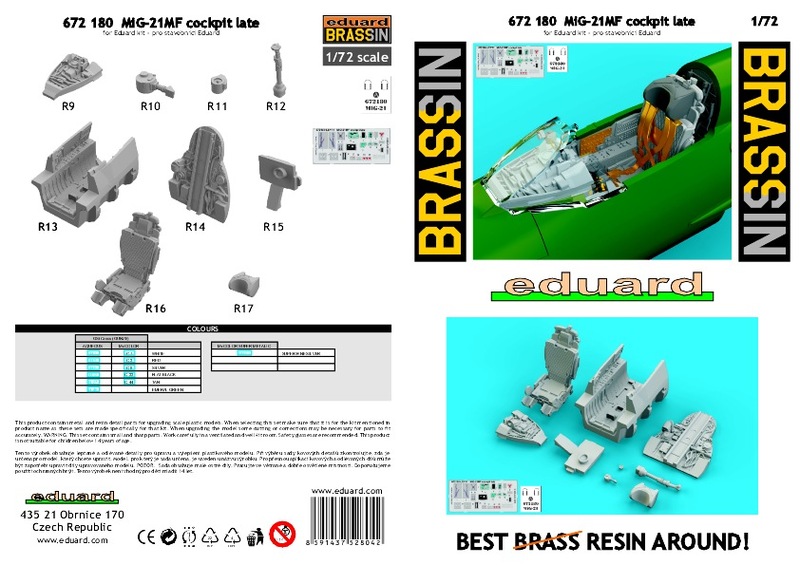 Last summer Eduard released its much anticipated MiG-21MF kit in 1/72 scale. The initial release represents aircraft manufactured at the Gorky factory. In conjunction with the release of this kit, Eduard also released a separate resin cockpit set for these late model MiG-21MFs. 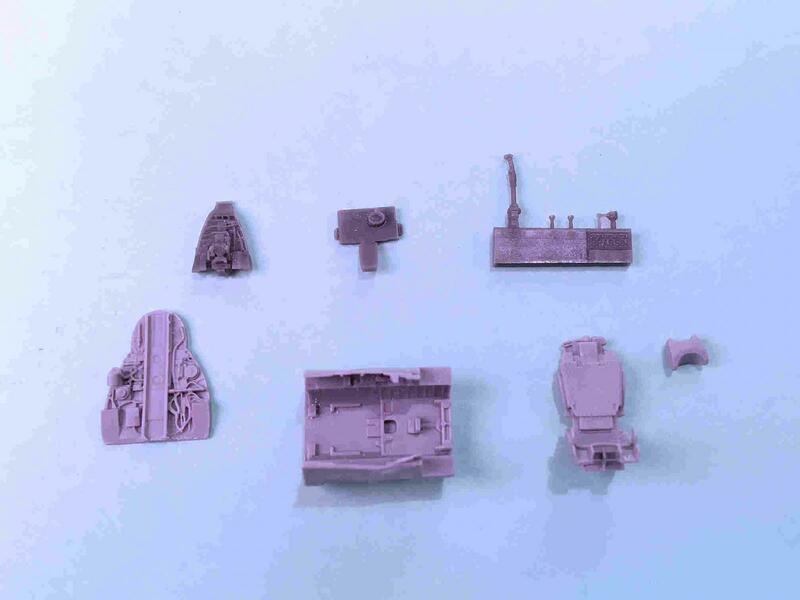 The set includes nine resin parts, a color photo-etch fret and an acetate sheet with 2 heads-up screens and is intended as a complete replacement for the kit cockpit and ejection seat. As you would expect with Eduard, the resin parts are beautifully cast with exquisite detail and the detail on the photo-etch set is crisp and sharp. Construction starts with painting the ejection seat and the separate headrest. Eduard's color key references Mr. Hobby/Mr. Color paints, but as these are not common where I live, I used an online paint conversion chart and the "eyeball" method to convert the colors to Tamiya paints as I have a decent supply of these colors. The base color for the bulk of the seat is Neutral Gray with Light Gray for the headrest, seat cushions and a few details. I used XF-66 for the Neutral Gray and XF-25 for the Light Gray. I used a black tempura paint wash to bring out the quilted detail in the seat cushions. After the paint had dried, I sprayed a coat of clear flat to seal everything then added the photo-etch seatbelts and the ejection handle. The ejection handle needs to be bent slightly so that it forms a wide "V" shape when viewed from above. I then set the seat aside to be added during final assembly. The next step is to paint the cockpit tub. The instructions advise you to paint the cockpit Mr. Color H-46 Emerald Green, however, this color looks much to green to me, so I experimented with a custom mix of 4 parts Tamiya X-14 Sky to 1 part Tamiya X-25 Clear Green which turned out to be pretty close to the color Eduard used on the color photo-etch sheet. I used this color for the main cockpit, the rear bulkhead, the instrument panel and the cockpit coaming. After this had dried, I dry-brushed the side consoles black and gray to bring them to life. I also attempted (with mixed success) to dry-brush the details on the cockpit sides, but as the cockpit curves inward, access is a bit difficult. I then added the photo-etch panels and levers to the cockpit sides and the rudder pedal straps. The instrument panel is made up of several layers of photo-etch, but before these are added, be sure to paint the radar screen housing flat black as it protrudes through the completed panel. I added a drop of clear green on top of the black to simulate the screen color. After the panel was completely dry, I put a drop of Future in each dial to simulate the instrument glass. The set includes a resin control stick with a photo-etch paddle (nose wheel steering? ), but I left this out until after the cockpit had been mounted in the kit and the ejection seat inserted in order to avoid knocking it off inside the kit. The cockpit's rear bulkhead is very nicely detailed and the instructions have a good illustration on how to paint the details on the bulkhead, even though much of this work will not been seen once the ejection seat has been added. The next step is to mount the cockpit set into the kit. As the cockpit and the nose gear wheel are all built up on a single part (D69) of the kit, I was surprised to find no reference in the instructions for the cockpit set as to where to cut D69 in order to attach the completed resin cockpit. I ended up attaching the forward cockpit bulkhead (D63) and then cutting D69 just aft of D63 as my best guess of where these parts meet. I then attached the remainder of D69 to the left side of the kit fuselage and once it was set I test fit the resin cockpit and attempted to close the fuselage halves. I either was off a little in my alignment or the rear bulkhead is a little too big as the fuselage halves did not quite close. I lightly sanded the edges of the rear bulkhead and repeated the test fitting until the fuselages met top and bottom. Before cementing everything together, be sure to add etch part PE21 to the left side of the cockpit. I also test fit the fuselage spine at this time and discovered I needed to sand down the rear bulkhead a little in order to get the spine to sit correctly. Once everything fit as intended, I used superglue to attach the resin cockpit to the left fuselage half and taped the right fuselage half in place while the superglue set. I had previously constructed Eduard's resin engine exhaust set, so this was added along with part D68 (the radome attachment) and I then closed up the fuselage and glued the two sides together. While the fuselage set, I completed the painting of the instrument panel coaming according to the instructions. I painted the heads-up lens chrome silver to help it pop a bit. A little dry-brushing with gray helped bring out the wires and other details on the coaming. The last step was to add the photo-etch quarter panels to the coaming and then the small parts R10 and PE15 which appear to part of the heads-up system and finally the acetate projection screen. The coaming is then slotted into the assembled fuselages as a direct replacement for the kit part. This is a really nice set from Eduard and lets you really go to town in detailing the cockpit area. 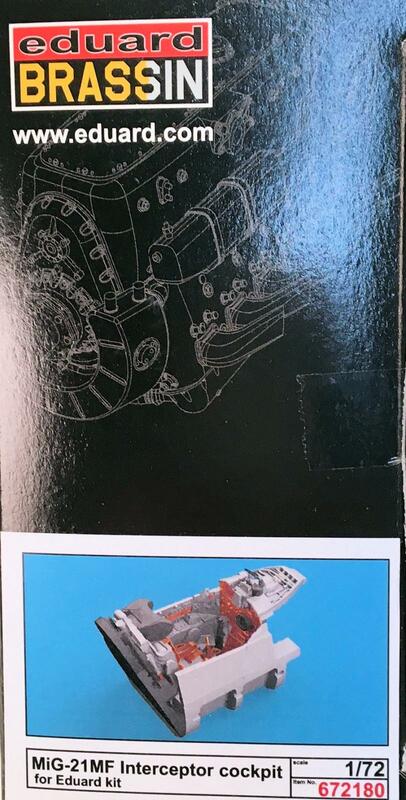 My only real concern is the lack of any information on where to cut the kit cockpit/nose wheel well part in order to fit the new cockpit. The difficulty I had in painting the sidewalls is due more to my shortcomings than this set. Thanks you to Eduard for the review set and to IPMS-USA for letting me review it.